Demonstrations/Protests in Turkey - Miata Turbo Forum - Boost cars, acquire cats. Hakan - Can you give us your impression, as a godless commie living in Turkey, of what's going on with the riots in Istanbul? What are some specific reasons they are protesting and now rioting? I see some coverage with vague remarks about the "totalitarian" and "authoritarian" rule of Erdogan, but no detail. 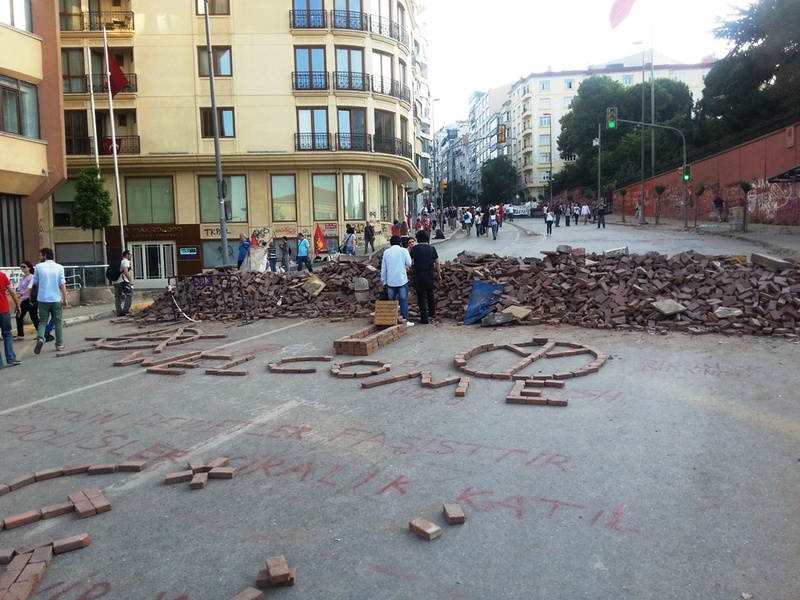 I thought I heard one of the more recent big catalysts involved Taksim Square. That seems like a pretty good explanation: lots of resentment of the reduction in the separation of church and state and restrictions over some secular freedoms (e.g. sale of alcohol?). 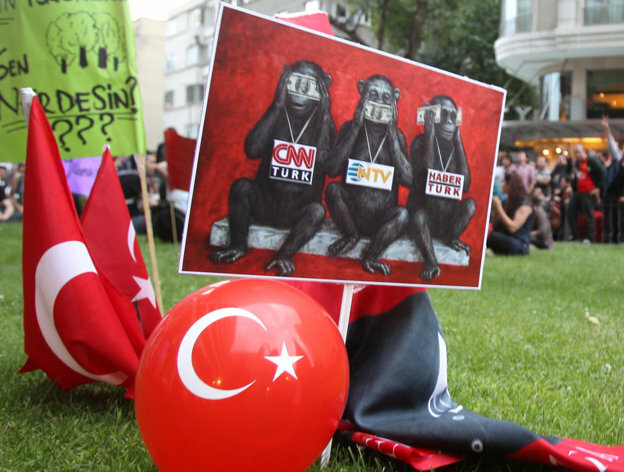 It's so hard to know what's going on because the media in Turkey is all being blocked/buried. I've been seeing a lot on how main media has been covering up the riots and everything going on there. All the pictures I've seen on it are intense. Not having cable tv I was ignorant of this until some facebook post yesterday. Been trying to find out what is going down. Seems it boils down to some standing up against their rights being taken away? I love that some have their own gas masks. Paraphrasing John Kerry, "Whom amongst us does not own gas masks?" Sorry guys, I was in Taksim all day. Just came home. That park was slated for demolition, and they were going to build a shopping mall there. "butchering the green" has become the norm here of late, and that park was the last straw. Police literally attacked the protesters, who were - really - just peacefully sitting in the park. That was the spark that started the movement. More than a couple MILLION people are involved now. Police shot tens of thousands gas canisters into peaceful protesters. There are casualties. Cops ran out of tear gas (they were using ambulances to transport canisters) and switched to some unknown compound. There was a virtual media blackout during the first few days of the protests. 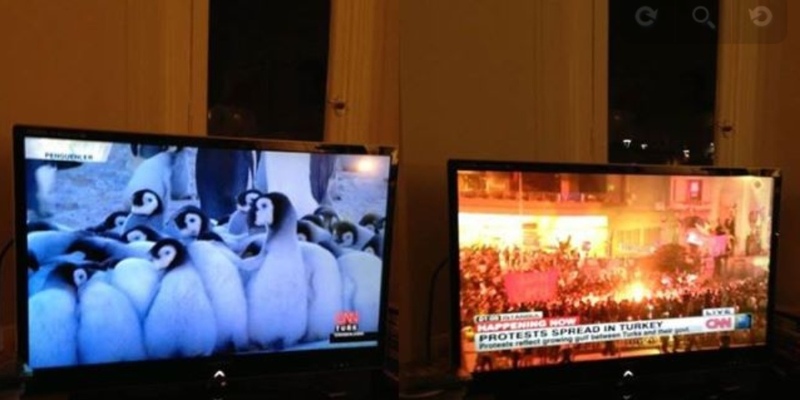 Hundreds of thousands of people are in the streets round the clock, all of the mainstream TV stations were airing cooking shows or penguin documentaries. PM Erdogan promptly left the country "for an official visit" to Morocco. King of Morocco declined to meet him, and Tunisian officials flatly refused to attend a dinner, citing what's happening in Turkey. Taksim Square (the most prominent and significant public gathering place in all of Turkey was successfully occupied very early (day two IIRC), and that's when the MP appeared on TV with threats. He claimed they were having trouble keeping his voting block, reportedly in the millions, contained. He said they were home for the time being, and not getting out in the streets! That is provocation, pure and simple. he is threatening half of the country, using the other half. Police are given orders to take no prisoners, to show no mercy. They have used about 12 million dollar's worth of tear gas so far. Police is aiming at people's faces when they shoot those tear canisters. Too many people are seriously wounded. Ungodly concentrations of tear gas in the streets have dissolved many contact lenses, people have gone blind because of that - all documented. This led to a new term in English, Chapuling! Media blackout created a massive backlash.. About 35000 credit cards (from Garanti Bank, whose owner is the boss of one of the major media outlets on Turkey) were cancelled in one day. People closed their accounts. There were national cafe chains who refused to help protesters on the first two day, and there is a widespread boycott going on as we speak.. Those cafes are virtually deserted all over the country. The PM is scheduled to return this evening. He seems out of touch with what's going on, and acts in total denial. Meanwhile, there are and have been for at least a week, major demonstrations all over the country in support of Taksim. Police is brutal in those places, either attacking peaceful citizens, or standing by and allowing pro government militants mount attacks. Today is day number 10. No one could have foreseen this 15 days ago. No one can tell what will happen in another days. Nothing like this ever happened in Turkey before. largest demonstrations in Turkey lasted maybe a day so far, and this Government somehow managed to unite millions from all walks of life. Even fans of rival soccer teams have come together and formed Istanbul United. Just that says a lot about what's happening over here. I hope you stay safe, and I hope you fight for your liberty, and I hope you have wisdom when you have to choose between safety and liberty. These are interesting times to say the least. Tomorrow will be day 11. We'll see what comes our way. Thanks for your input, Hakan. I second Mark's remarks about staying safe (and staying out of jail) while working to maintain or reclaim your collective freedoms. Can you speak to some of the specifics of the resentments of the protesters? I have read about restrictions on alcohol sales. What are those restrictions? I have also read about the park - it seems Erdogan unilaterally decided to move forward with a commercial development project after local groups initially rejected it. I have also read that the developer is somehow related to Erdogan and that smells of a type of corruption (crony capitalism). I am going to assume you are biased in support of the protesters and in opposition to Erdogan and the religious right. As objectively as you can, can you speak to the riots? In New York City, the OWS crowd gathered some initial legitimacy because they were largely peaceful (to outsiders) and largely focused on protest. In Oakland, California, they immediately lost legitimacy as they seemed bent on chaos, anarchy, and an excuse to throw molotov cocktails and break ****. The rest of this is my only-semi-educated musings, being largely ignorant of the history and current situation in Turkey. 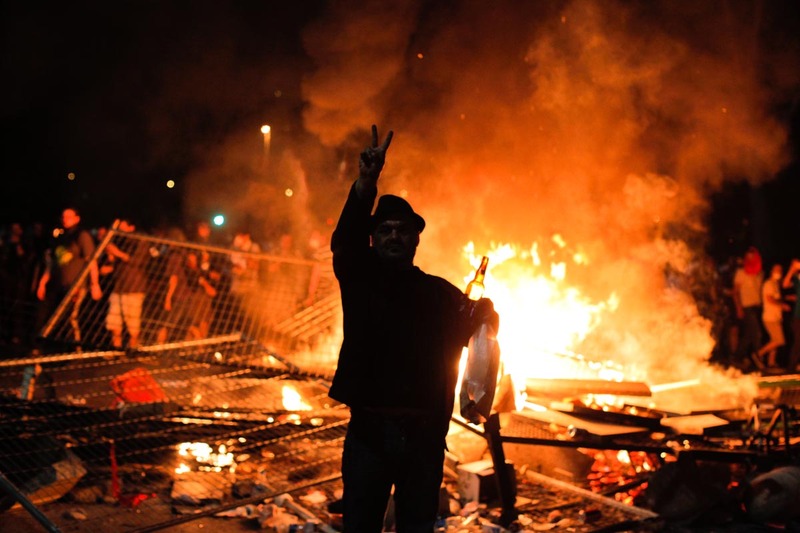 It's interesting the parrallels and sharp distinctions between the Occupy Wall Street movement (which started out with peaceful protests in a park) and the Turkish movement. The OWS crowd had many and varied issues but shared a collective disgruntlement that had simmered for a long time before coming to a low boil. Most of their issues were rooted in economics with political spillovers. That is, a primary complaint was about disparity in wealth distribution (e.g. resentment of the 1% vs the 99%) and a stagnating middle class. Included in this were issues with "crony capitalism" (e.g. the big bank bailouts). It seems the ResIstanbul movement is much more rooted in politics and religion. Turkey has been one of the fastest growing economies in the world under Erdogan and has added more jobs than any of its neighbors. However, from what I can understand, it seems there is a large split in Turkey among the "godless commies" and the Islamic traditionalists. Politically, Turkey has been among the most secular nations in that near Asia area as I understand it, but Erdogan has allegedly been letting more and more Islam creep in to the government. What is really interesting to me at this point is the difference in reactions to how the initial protesters were treated. Occupy Wall Street was most left alone to their own devices and eventually fizzled out. The Taksim Square protesters were immediately faced with strong resistance and that only fanned the flames and caused it to spread. I'm sure the Streisand effect isn't helping. That plus a MUCH more violent initial reaction seems to have kicked it off with a bang. Before I post on the details of what's going on in Turkey I would like to respectfully ask the OP or the mods to please change the thread title to "Demonstrations/Protests in Turkey". This is not a riot. No one is rioting. There is no violence by the people. Peaceful protesters are exercising their rights to voice their concerns while being subjected to tear gas and water cannons. No one is fighting back. The only allowed action on the part of the protesters is throwing back gas canisters that land nearby. Violence, littering, property damaging is strictly discouraged. People carry musical instruments, they are "armed" with gas masks and goggles. The most dangerous thing I have personally witnessed in the crowds is a hot cup of tea some people are drinking while taking a rest. There is graffiti all over the place, of course. But, that's not violence. People (protesters) are constantly accused of forcing "excessive intellect" over the law enforcement. Someone wrote "police brother, you bring tears in my eyes" on the pavement for instance. So, this is not a riot. No one owns this protest so far. No one has been/is organizing the people in the streets, no one has put out any sort of a call for the people to get out and assemble someplace. People took to the streets and rushed to Taksim Square instinctively once law enforcement started mounting violent assaults on peaceful protesters and truly innocent bystanders. Taksim is tantamount to Times Square; there are hundreds of thousands of people there at any given time. Police were shooting gas into city buses, buildings, down subway stairs, on older people, tourists, I mean literally everyone on that day. The news quickly spread and people rushed there in large numbers. People who would never think about getting together under normal conditions formed an instant alliance. Soccer rivalry among the three prominent Istanbul clubs (Fenerfahce - FB, Galatasaray - GS, and Besiktas - BJK) is legendary. Fans hate each other, away games are always violent, and there is a very well understood animosity among these clubs. But, on that day, when police forcibly detained 50 Fenerbahce fans, 400 GS fans rushed over and saved them from the police. After that "Carsi", the incredibly vocal fan base of BJK stepped in. within an hour, they formed an alliance, and called it "Istanbul United". Now they are acting as one. Turkish Communist Party, labor Unions, Greens, Separatist Groups, teachers, musicians, athletes, housewives, Students, professors, regular folks, gays, doctors, wealthy and the poor have all come together. Understandably, there is a plethora of demands. I will try and do my best to convey a common thread, while doing my best to not turn into a mouthpiece for any specific group/interest. First order of business is the PM's resignation. This is unanimous. people seem to be tired of the PM's devil may care attitude. Everyone resents his dictatorial air. His tone has always been "whatever I say goes". People do not appreciate his defiant attitude, they want to be heard, and have a say in things. There is also a growing concern over demolishing the "green" in Turkey to make room for development projects by special interest groups with close ties to the current government. Turkey - the Republic - is a young nation. Ottoman Empire was officially abolished in 1923, and the Turkish Republic was established in its stead. This is easier said than done. Some still yearn for the empire days, and refuse to recognize what has been done so far in the name of modernizing the country. So, today's Turkey is a very strange mix of the old and the new. Words fail to describe it, you need to see it to truly understand what life is like around here. Women are bothered with the PM's attitude, as well. He keeps telling women they should have at least three children, for instance. Or, they publicize private information on women who have an abortion. Same goes for birth control in certain cases. There is also a deep wedge being driven into the society. The PM's voting block dresses and acts a certain way. they regard the rest of the country as godless drunks, engaging in debauchery at every chance. That is a major cause for resentment. Anyone with ties to the current administration has become really rich over the past ten years. Corruption, government incentives, etc are hot issues. AKP (PM's political party) came out with 50 per cent of the vote in the past couple of general elections. It is common knowledge that millions of rural residents were given coal, firewood, rice and pasta (makarna - happens to be a buzzword over here) in exchange for a promise for votes. People were made to swear on the Koran that they would vote for him in many cases. So, it is this blatant "buying of the uninformed's vote" that angers the remaining 50% of Turkey. AKP is well organized, well funded, and they know how to play the religion card to secure votes. Many were outraged over the "hanging chad" incident in Florida. The "makarna" issue dwarfs that by comparison. Since Turkey is a young nation, the fact that many of the essential and major enterprises such as oil refineries, power plants, railways, the highway system, universities, etc were initiated and owned by the state can easily be understood. There was no private capital in the country to start up an economy on the heels of a major independence war back in those days. Pretty much all of those enterprises were sold at a bargain to multinational companies over the past decade and a half. Revenues from such sales bring forth a temporary feeling of welfare and relief to the economy, but the big picture could be far from optimistic. Damn.. I am tired of typing here. I'll do my best to answer/respond to questions and concerns to the best of my abilities, but please understand that I am just an ordinary guy, observing and taking in whatever I can from my end. Also, please keep in mind that English is not my first language. Please (and this is a big please) remind me if I am not able to make myself clear, or use language that may lead to any sort of a misunderstanding. Also, I personally feel like a thank you is in order to everyone who take an interest in what's happening in a non-oil producing country on the far side of the planet, and take the time to read or post their thoughts. Thank you for taking the time to type that. You are putting your thoughts down very clearly and in easy to read/understand format. I will fix the title of the thread for you, but if you do want to get the riots started follow this short clip by the Boondocks and the riots will start. No, I'd like to thank YOU for telling us about it. Our media today is so fucked up it's not even worth listening to what they have to say about it, so I am really grateful that I get a first-hand account of what is going on over there. Thank you, Hakan, for sharing your impressions with us. We will ask for clarification, but your English and grammar are better than 75% of new members that were born in the USA. I was initially quick to brush off the protests as exactly the same as a bunch of the "Occupy" types but I always try to keep an open mind. Once I did a bit more research, there are some big differences that I wanted to learn more about. Also, thank you, Lars, for fixing the thread title. However, forgive me if I am skeptical that there has been no rioting and no property damage caused by the protesters. I can believe it's possible, but I am skeptical. I can more easily believe that it's been very limited (like New York City) vs widespread (like Oakland, California). With national media ignoring or being blacked out, it's possible the minimal rioting is just not on your (admittedly sympathetic) radar. I wish you were here to witness what's happening. Yes, any pic with fire contains undertones of a riot..
What many people do not realize is the fact that incendiary gas canisters shot from police panzers have started 99.9% of the fires. People were frantically building barricades to save themselves from the panzers (They are called TOMA here (Social Incident Intervention Vehicle), they are huge armored vehicles with extraordinary water cannons and various ports for shooting tear gas canisters. 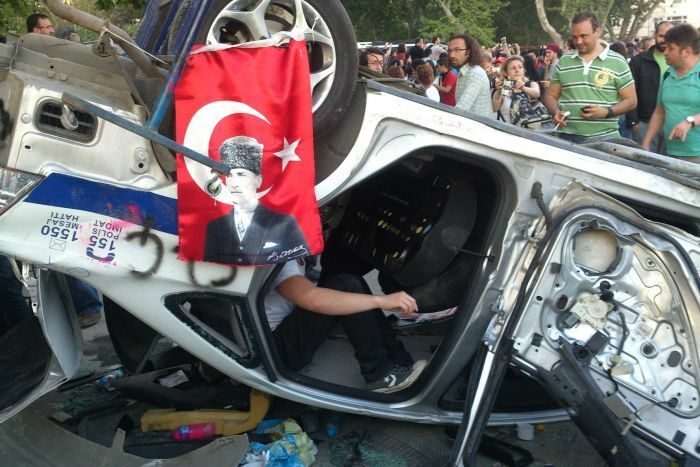 There were a few police cars that were abandoned in Taksim square. People destroyed them. Some say they were left there on purpose as bait, to provide material for the government friendly media. All that happened during the first few hours. 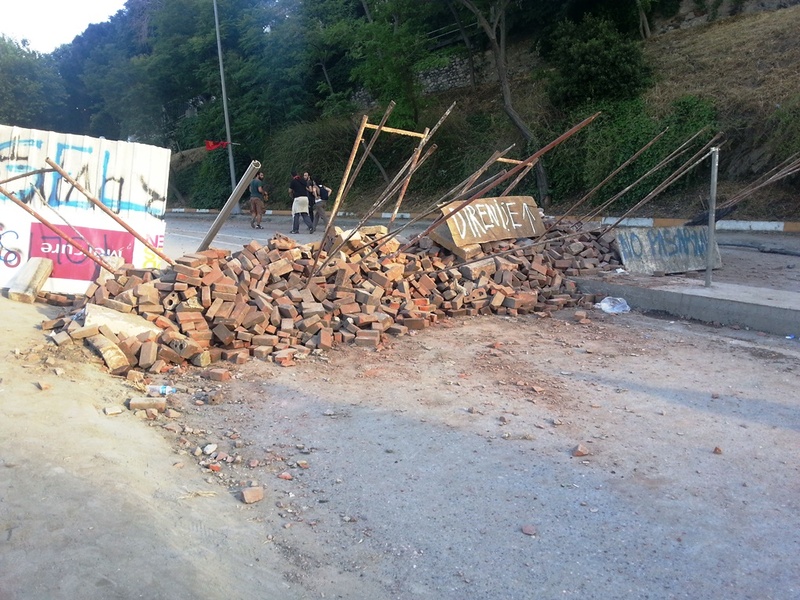 People built barricades with whatever they could get their hands on. The most commonly available material was pavement bricks on the sidewalks. The white sign on the second pic says "to resistance"
And, Jack, you are correct in thinking/assuming that Turks do not enjoy the same level of freedom speech as US citizens. 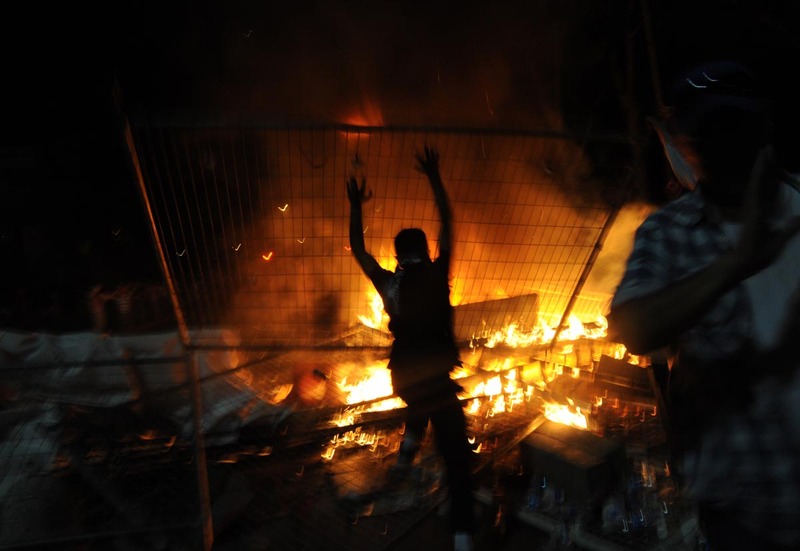 38 people were detained in Izmir (an Aegean metropolis) for incendiary tweets. Some of the messages were "Water cannons are coming our way", for example. They let go 37 of those people after 36 hours. But, they managed to send a message to people tweeting about the incident.